In Warsim your only goal is to keep the Kingdom of Aslona from destruction at the hands of it's enemies, fighting off the rebellion of Faradal the Kinslayer and his turncoat army. The Massive horde of Phenor, overlord of the masses of bandits. The great goblin kingdoms of Krut and E'rak as well as countless other minor bandit groups and kingdoms of randomly generated races. Warsim's goal throughout development was to simulate ruling as king unlike any other game before, you will be made to feel like the ruler of a kingdom, with countless decisions you can take to shape your realm and bring your kingdom into glory or obscurity. Scores of places to explore including, a giant blackmarket filled with mystery and wonder, hidden cities (that's right multiple of them), Two schools where you can take lessons, one in music and one in history, a procedurally generated newspaper, and tons more, there has been an excessive amount of time spent fleshing out the world, exploration is heavily rewarded. An arena which you can takeover and grow, or watch and bet on, holding giant tournaments and rooting for champions as they climb the ranks and get remembered for eternity. A unique facial procedural generation system that can produce well over 100 quadrillion different faces for a variety of different races from Humans and orcs, to kobolds and treemen. Deal with the throne room, a complex place with thousands of possible encounters and visitors, how will you manage the realm and treat your people? Tons of random events, no game will be the same, with the kingdoms, rulers and events always being different and hard to predict. Procedurally generated kingdoms, bandit gangs and mercenary groups, never get the same group twice, be they Seafaring Goblins, Fire Orcs, Eyeless Elves or the Famed Half-Turtles of the Western Turtledom, all these races possible and a million more. Countless mini-games played in taverns, your throne room, or around in the world to keep you entertained. 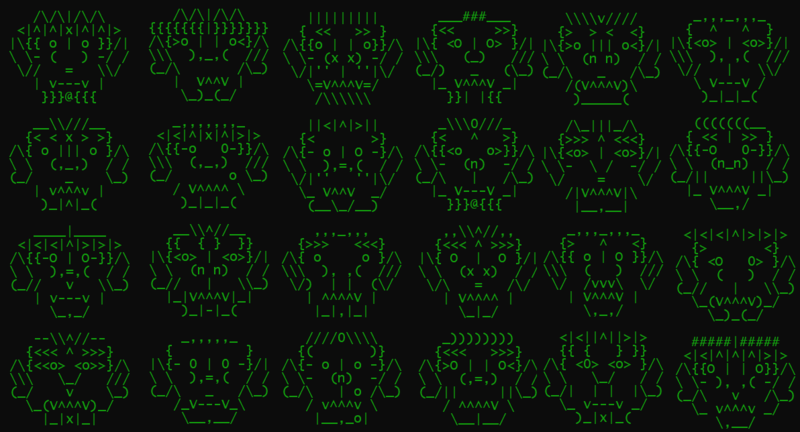 Warsim has some very unique features, including it's procedural face generation system, which can produce over 100 quadrillion different ascii faces for various fantasy races, so many that you can guarentee every face you see is completely unique to you and your game and will not be seen again. A concise development history can be found over on the Warsim subreddit, which documents the last few months of development and near-daily changelogs and updates to the game. Here we see a resonably sized throne room with a long line of visitors. Here we see the demonic realm and monstrous place! Here we see the historians guild, a place you can go and take exams and classes. This page was last modified on 11 March 2019, at 23:56. This page has been accessed 39,510 times.